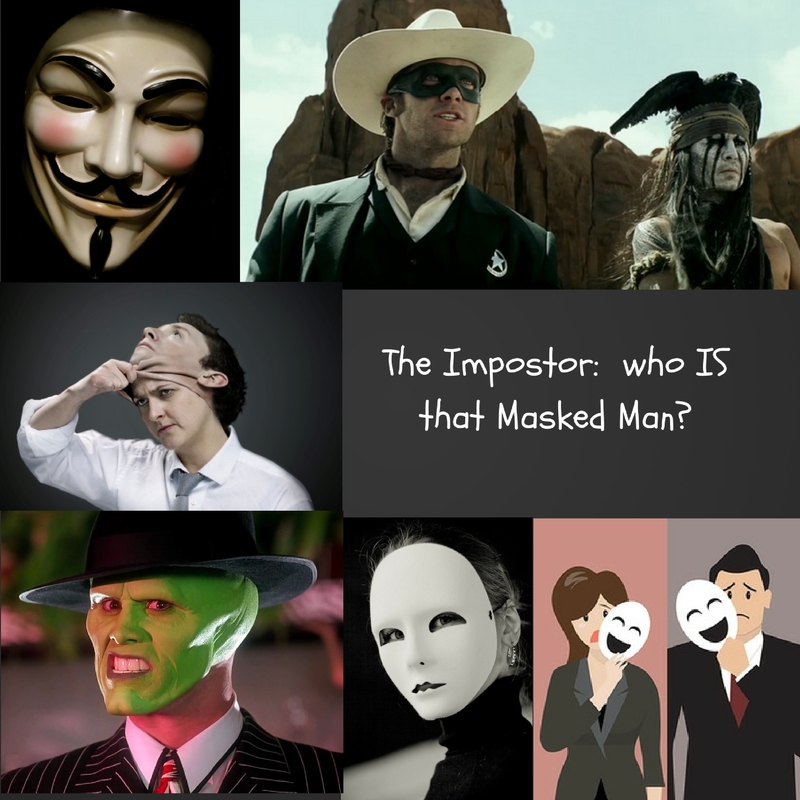 The Proud Impostor: Who Are You, Really, Behind that Mask? If you are reading this, you have probably exalted yourself at some time or another. It’s human nature. You have looked in the mirror and thought, “I look good!” You have spent money that didn’t HAVE to be spent on some personal treat. When you have confessed your sins, maybe you are relieved that there are other folks who are far worse. Perhaps you have merely taken pride in an accomplishment, or perhaps (like me) your pride has subtly exercised itself in less edifying ways. Maybe you have been secretly glad that you were not like someone more evil or less principled than you; maybe you shake your head at someone else’s rude behavior, and are glad that you aren’t like that. My good friend Mark Krimm and I were accountability partners for several years, and one of the things we discovered was that we not only had an Impostor, but we have an Impostor to HIDE the Impostor. He’s the guy who humbly acknowledges his sin and brokenness 1) without sharing all of it, and 2) is secretly proud of how humble and transparent he is. He looks good on the outside, but his priorities are messed up and he’s really not doing business with God where it counts. Unfortunately, there is no such thing as external spirituality, and it hurts to realize sometimes that I have the capacity to portray a humble but broken Pharisee, even though I am an unfaithful dirty rotten sinner. On the other hand, the tax collector had no such pretense. He didn’t even deserve to be in church, but he was there, praying an honest prayer. Israelites despised tax collectors because they worked for the hated Romans, and were considered traitors at best, extortionists and thieves at worst. They were social pariahs, the lowest of the low. In the gospels, they are often mentioned as synonymous with sinners, as in “tax collectors and sinners”. No Pharisee worth his salt would even go into the same room as a tax collector, and yet Jesus called one (Matthew) to be his disciple, and had several notable encounters with them. This story about prayer and confession would have offended and enraged the Pharisees, but it gives hope to the honest sinner who 1) is so convicted and downcast that he is absolutely humbled before God (he couldn’t even raise his eyes towards heaven); 2) is passionate and truly sorrowful about his sin (he beat his breast in anguish); and 3) is honest and repentant before God (he begged for mercy). The question that arises from this story is, which category are you in? A proud Impostor who feels self-righteous, or a humble sinner begs for mercy? Every day we choose one of those attitudes or the other. Both of those folks will be surprised by God’s response; but only ONE of those folks will be justified. Where they could take some time to pray. And one felt bad, while one felt good. "I thank you, Lord, for blessing me! I thank you I don't drink or cuss! While other people love you less." "Oh Lord, be merciful to me!" When only one is justified.